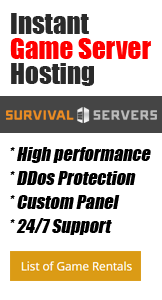 To enable custom maps or mods for your Unturned server, you will need to have access to FTP. For those who are unfamiliar with it, please refer to the instructions found on the FTP Access page. To get started, you will need to access the community workshop for Unturned. In your Steam library, then click on the Community tab and choose the Workshop option. On the next screen, in the textbox shown below, type in "Untured" and then select it when it appears below. Once you find the mods / maps you like, click on the Subscribe button. Steam will begin downloading the mods to your library once you do this. Once you have downloaded all of the workshop mods for your Unturned server, you will need to upload them to your server via FTP. Uploading maps and mods to your server are similar, with small differences in where the files go and how to reference the new map for your Unturned server. The MAP_ID_VALUE can be found at the tail end of the URL for the mod, when viewing it via the Steam workshop. Go to the /Servers/Server/Workshop/Maps folder in your FTP directory. Upload the map mod from your computer to the FTP directory. Go to the /Servers/Server/Server/ and open the Commands.dat file. Change the value for the Map value to the folder name, as shown in the screenshot below. After you do this, use the Start, Stop, or Restart buttons at the control panel to manage your server's controls, as the green button may overwrite your changes to this file. Similar to how maps installed, the key difference is where the mods are uploaded, as well as leaving out Steps #4 and #5 from above. Go to the /Servers/Server/Workshop/Content folder. Upload the mod folders from your server to the FTP directory for your server. After editing/uploading/deleting your files in the proper directories, close down your FTP client and start your server from the control panel.